In creating a hierarchy of quality for colored gemstones -- a "quality pyramid" so to speak -- we must put beauty at the pinnacle, with "provenance" and "enhancement" as the cornerstones. Beauty must be considered first and foremost in any decision about buying a colored gemstone. Seeing it should make you desire it immediately. The next day, if anything, it must be even more beautiful than the day before. By 'beauty' we must include all of the ingredients like color, tone, shape, size, brilliance cut and clarity. Each gem material must be judged against its own standard: Sapphires to sapphires, and emeralds to emeralds. Interestingly, the word 'gemstone' is actually an absolute term for only the finest example of any gem material. Using that for a moment as our guide, a 'gemstone' must be large enough to be rare for that type of stone. It must be optimally cut with an articulate shape, full brilliance, ideal proportions, free of imperfections that disturb the gems brilliance and luster with a color pure and true as only found in nature. Clearly, a true 'gemstone' is rare indeed! Influence 1) GEOGRAPHIC PROVENANCE: Country of origin determinations (especially premium origins ie. Kashmir sapphire, Burma ruby or Colombian emerald) have a profound affect on the value of a gemstone. Ideally, gems from differing countries of origin exhibit distinct characteristics which can easily be distinguished by an expert in the field. But very often there are overlapping characteristics which can make it difficult for an expert using only microscopic magnification to determine origin. This is where a reputable, internationally recognized gem laboratory certificate can play an important role. The laboratory's rigorous testing will verify with a relatively high degree of certainty where the gemstone probably came from. Caveat: Despite scientific and optical testing, origin ID is not an absolute as the laboratories struggle to stay ahead of treatment and mining trends which can result in lags between certification and reliably pinpointing a precise origin. Of all influences, geographic "premium" origin will typically be the most common attribute in adding value to a gem purchase even though origin determination can sometimes result in conflicting findings for the same gemstone when certified by more than one reputable laboratory. We also advise our clients not to let a premium geographic origin sway them in favor of a gem that may not be of a quality deserving a premium valuation. Influence 2) MANUFACTURING PROVENANCE: Manufacturers, cutters, craftsman - the real artists who ultimately 'create' provenance and make gem history one creation at a time - earn their colors the hard way; time must pass - preferably decades - and during that time the artisans must earn the respect, support and admiration of peers, clients and the press. There is little disagreement that few - if any - understand a gem or a jewel better than those who expertly form them in the first place. When properly identified, the source of manufacture can impact a gems value though not as significantly as geographic origin in general though there are exceptions like JAR of Paris whose jewels seldom come to market but when they do, regularly command extraordinary premiums. Jewels that are manufactured by classic houses like Faberge, JAR or Carvin French as well as gems that are cut by the Reginald C. Miller lapidary are eagerly sought by collectors in the know. Clients seeking these notable manufacturer name bearing items recognize the quality of the build, the optical distinctions that separate their handiwork from all others and the consistency over decades in delivering excellence. Estate experts pride themselves on identifying manufacturing styles which when coupled with a manufacturers mark, documentation or verification provide collectors with a high degree of comfort and certainty as pertains to the items emergence into the marketplace. Influence 3) DISTRIBUTING PROVENANCE: Well known retailers, auction houses and jewel salons around the globe wear their nom de jewel as their crown and are readily identified at auction or resale. See the video on an important necklace built by Reginald C. Miller himself. While some of the global high-end haute-joallier retail houses have their own jewelry manufacturing facilities, collectors may actually find it more difficult to pinpoint the actual manufacturing source of the gem or jewel versus the distributing/marketing source of the jewel. There exists a 'quiet' industry of wholesalers who traditionally provide private label product for retailers to affix their own signatures therefore one cannot determine with a high degree of certainty if indeed a gem or jewel was manufactured or simply privately distributed by a name retailer. Notwithstanding, some retailers will provide concise documentation especially when presenting the jewel as being manufactured in their workshop thereby providing a buyer with a high level of certainty and provenance. Influence 4) CELEBRITY PROVENANCE: Whether a pair of emerald earrings sold at auction from Elizabeth Taylor's stunning jewelry collection or a multi-colored collection of precious gemstone crosses belonging to the Duchess of Windsor, gems and jewels emerging from the property of royalty or a celebrated owner often attract the spotlight while breaking auction records and garnering the highest level of press coverage. While some gems and jewels are commissioned from well known sources, celebrity ownership is not always a failsafe influence in defining a gem or jewels actual origins thereby creating a skewed relationship between value and the stewardship conferred by celebrity. Collecting gems owned by storied prior owners requires a keen eye in balancing the jewels inherent value, the items manufacturing or distributing origin with the more relatively hard to define aspect of a prior owners current and potential future celebrity status. Over the past 30 years, some of the major gem-producing nations have developed advanced technologies to enhance gemstones. They perceived this to be a 'breakthrough' thereby creating a greater quantity of usable gem materials for the jewelry industry. But not all of the enhancements have been as widely accepted as they had hoped. For our purposes, in the 'quality pyramid,' especially as pertains to collecting gems in general, no enhancement is always best. Yes, some enhancements are acceptable and permanent albeit less prized than their natural counterparts. Some laboratories have created gradating enhancement level identification in order to identify the degree to which an item has been enhanced. The caveats for collectors? The enhancement community is usually a step ahead of the identification community. 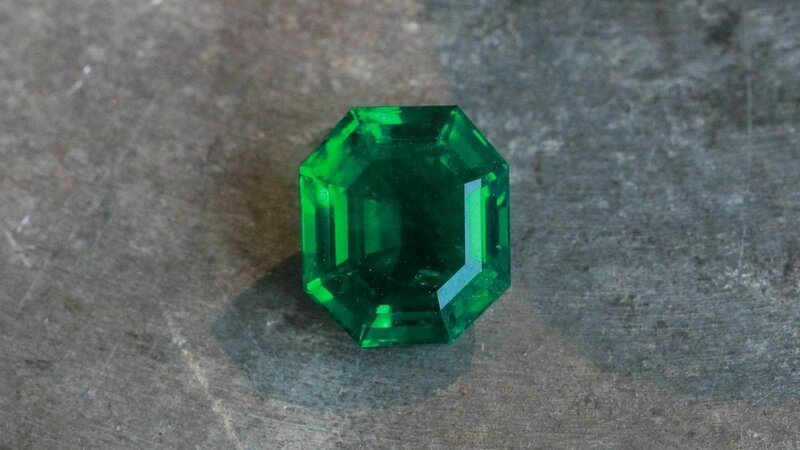 Gems that may have once been thought to be 'free of enhancement' - like demantoid and spinel up until the last decade - are now being re-certified as laboratory enhancement detection catches up with the 'treaters.' We believe that treatments which rely on 'fillers' and 'polymers' are by and large unacceptable although some collectors will accept gems like 'oiled' emeralds depending on the classification of their clarity enhancement level based on laboratory determination. As a rule, we have made it our purpose to involve our clients as often as possible in fine untreated gemstones, pristine and beautiful in a way that only nature can provide.